Home / back surgery / When is the Right Time to Consider Scoliosis Surgery? To better understand the treatment options for scoliosis, or a curvature of the spine, one first must understand the different causes of scoliosis. The broad categories of scoliosis include idiopathic, congenital, and neuromuscular, which are most often diagnosed in childhood, and degenerative, which is acquired as an adult. There are different considerations for children/adolescents and adults as to whether to consider scoliosis surgery; every curve is different! 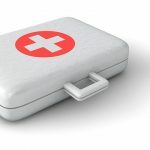 For children and adolescents, the reason to perform surgery is typically to prevent further progression, i.e. an increase in the size of the curve. ‘Idiopathic scoliosis,’ which means that there is not an obvious underlying cause, is the most common form of scoliosis seen in children and adolescents. These curves tend to increase in size the most during a period of growth, such as during a growth spurt. Therefore, if a curve measures a certain size before a patient has finished a growth spurt, this patient might be considered for surgical intervention. Medium sized curves are typically considered for brace management if a patient is still growing. If the curve is in the thoracic spine, which is the part of the spine involving the rib cage, then surgery is a consideration when the curve measures 45 degrees on X-rays. However, between 45 and 55 degrees, it remains unclear as to whether the risk of progression is great enough to warrant surgical management. When a curve measures 55 degrees, there is more concern that even after a patient has finished growing, that the curve will further increase, based on previous studies of many patients with scoliosis. Therefore, surgery will typically be recommended in this population of patients. However, even then, it comes down to patient and family choice, as there certainly are patients with larger curves treated non-operatively who are asymptomatic even as they become elderly! ‘Congenital’ scoliosis means that the spinal curvature is due to abnormalities in the spine that are present early in life. There are a variety of abnormalities within the bones of the spine, i.e. the vertebrae, that can cause the spine to become curved. Depending on the type of abnormality, these can have a high likelihood of progression, so surgery is often performed at a younger age in these patients to prevent a rapid increase in the curvature. It is important to know that these abnormalities are rather rare, and that typically they can be seen on plain screening X-Rays. 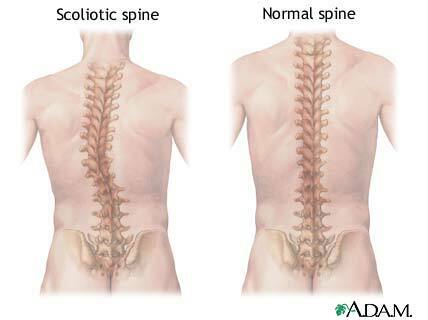 Neuromuscular scoliosis is called a ‘secondary scoliosis,’ meaning that it is due to another disorder- these include cerebral palsy, Duchenne’s muscular dystrophy, and spina bifida, also known as a myelomeningocele. Like congenital scoliosis, these curves can develop at an earlier age and have a more rapid rate of progression. However, the benefits of surgery to prevent progression of a curve must be weighed against the risks to the patient given the underlying disease. Managing these patients surgically requires careful coordination of a whole team of pediatric providers to ensure the best outcome. In adults, surgical management is more commonly undertaken to manage symptoms. Symptoms in adults can include pain within the back muscles or small joints in the spine due to deformity and arthritic changes as well as neurologic symptoms such as nerve pain or weakness due to compression of nerves. These symptoms can occur either in patients with idiopathic curves that did not have surgical treatment as adolescents or in patients with a scoliosis that has developed with time due to arthritic changes, i.e. a degenerative scoliosis. If a patient has worsening weakness in the legs due to arthritic changes causing pressure on the nerves within the lower back, this is typically a reason to more readily consider surgical management. This can include a fusion procedure, or at times it can include a smaller decompression procedure, performed cautiously to try and avoid worsening the size of the curve. Otherwise, if the primary symptoms are due to nerve pain alone, other conservative treatments can be undertaken such as medical management or epidural injections. Meanwhile, muscular-based back pain is best treated with therapy exercises aimed at strengthening the stabilizing musculature; there are even specific therapy regimens for scoliosis patients such as the Schroth method. One additional indication for surgical management is progression of curvature identified over multiple X-rays to evaluate the size of the curve. If there is significant progression with time, surgery may be recommended to stave off further progression of curvature. Particularly in post-menopausal women, it is important to maintain one’s bone density, as poor bone density can increase the likelihood of a curve enlarging in adulthood. For those who do not have declining neurologic function, the ideal time for surgical management is when the symptoms are severe enough so as to severely impact activities of daily living, outweighing the downsides of an extensive surgical procedure and potential for complications. It is best to speak with a surgeon who is used to working with patients with deformities such as scoliosis if one is considering surgical management; there are specific spinal surgeons who more commonly treat patients with spinal deformities. It can be helpful to have knowledge of exactly what to expect in the recovery period after scoliosis surgery; many patients have written blogs documenting their experience. There is more detailed information in the book, “Scoliosis Surgery: The Definitive Patient’s Reference,” written by a scoliosis patient who underwent surgical management. In the end, the best time for surgery is when one feels ready to undergo a spinal surgery after a full discussion with a medical provider. Many patients can successfully manage scoliosis without surgery, but for those who end up undergoing surgery, it is important to fully understand what to expect!